When Father Eustace Vollmere approached the mother superior of the Poor Handmaids of Jesus Christ in Donaldson, Indiana, and asked her to send him some nuns to become the nursing staff of a hospital he had opened, she refused until a facility was built to house them. The building went up by 1889, and in November of that year five sisters arrived. They helped Vollmere care for injured lumberjacks as well as the poor and homeless. Lumberjacks and dockworkers were guaranteed free hospitalization by donating $5 or $10 each per year, solicited by the nuns at lumber camps and on the docks. 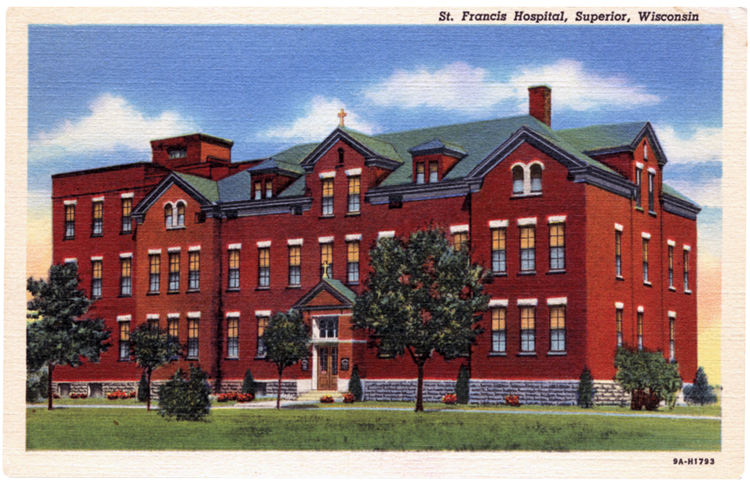 The building closed as a hospital in 1952; later that year Carmelite nuns converted it to a “home for the aged.” The nursing home closed in the late 1970s, and the building was converted to apartments before it was destroyed in 1985.